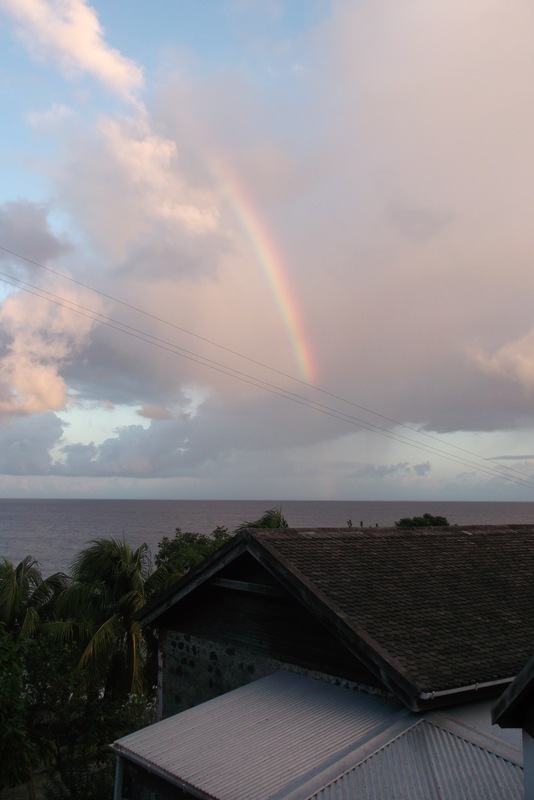 I visited the independent Caribbean island nation, pronounced “gruh-nay-duh,” not the Spanish-governed “gre-nah-dah,” a point that is often confused. The British and French colonized the island, which became independent in 1974. The U.S. invaded it in 1983, during the Cold War, but it did not fall under U.S. control. 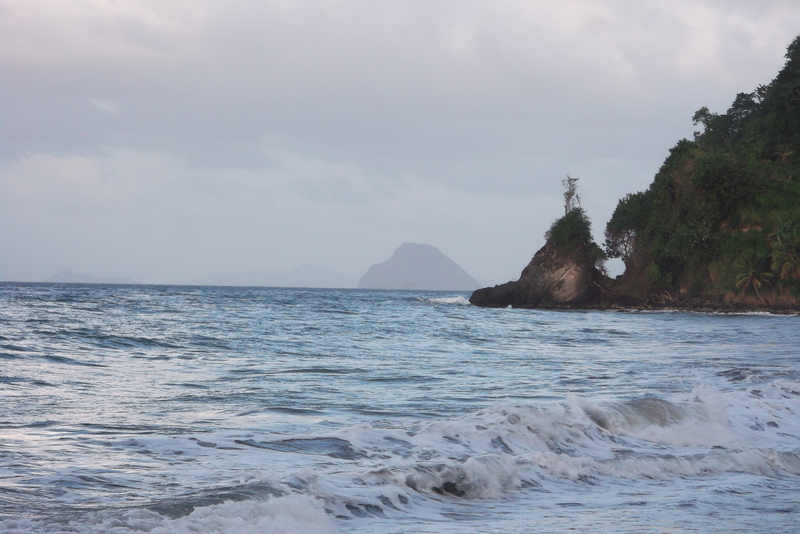 Located in the lower Antilles, its primary agricultural products are nutmeg and mace (which covers the nutmeg shell) – thus its branding as “The Spice Island.” Cocoa is an important and growing crop. Its cacao is defined as fine-flavor, being predominantly trinitario. 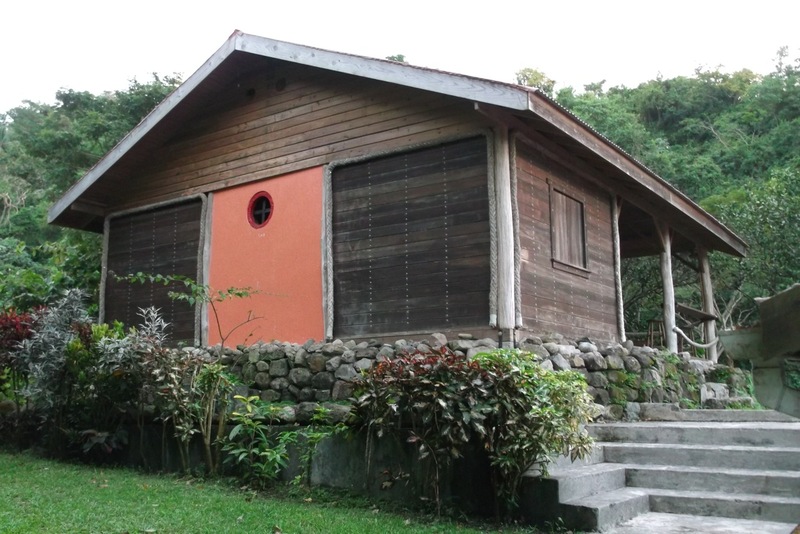 For much of the island’s yield, post-harvest processing (fermentation and drying) is done at centralized facilities governed by the Grenada Cocoa Association, a government-run entity that controls the purchase and sale of buys virtually the entire crop. 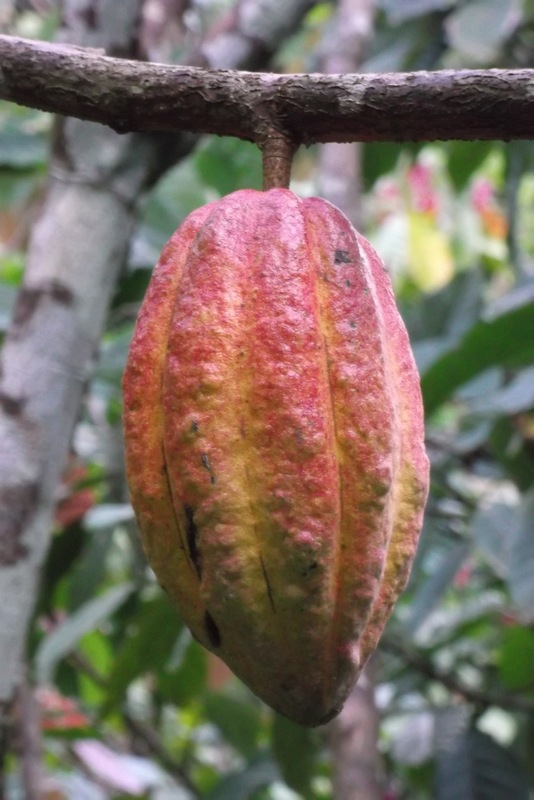 Given these factors, Grenada’s cacao can fetch more than double the world market commodity prices. Kim’s partner, Yvonne, who is a terrific cook and cacao farm worker, and her two children, were often at Kim’s. It was a wonderful experience to engage with a local family, and inspiring to see Yvonne’s hard work and skill in so many areas. Unemployment and poverty are high in Grenada, necessitating ingenuity and effort to make ends meet. Two of Kim’s friends from the UK, Mark and Peter, were visiting at the same time, giving me a double dose of cultural immersion. Kim his workers, and other volunteers had harvested cacao the week before I arrived, so one of my main tasks was to turn the cacao as it was fermenting (see photos). After workers cut cacao pods from the tree, they split them in half, scoop out the cacao beans and their sweet pulp, put this in a pile or contained space, and cover them with banana leaves, jute bags or the like. In the fermentation process, yeast digests the pulp and converts it to ethyl alcohol. This develops cacao beans’ flavor. 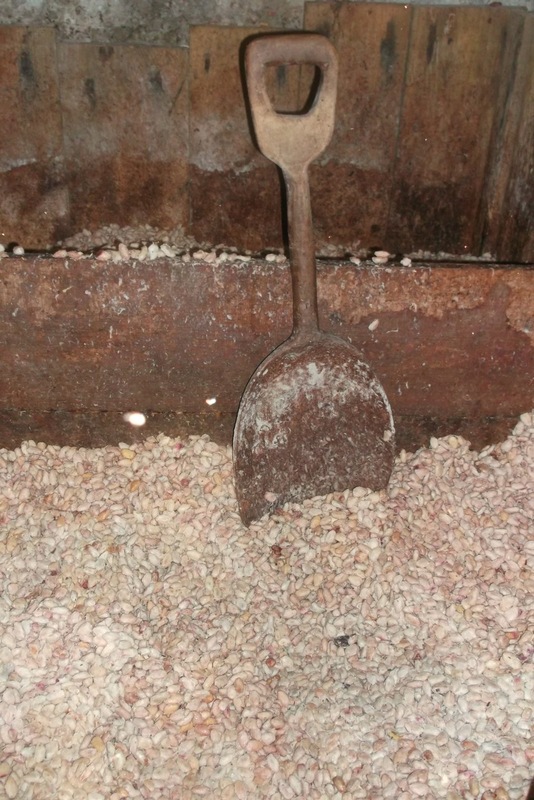 The cacao must be turned (moved to another bin or spot) to ensure even fermentation and temperature. It was fascinating to see, smell and feel the transformation across the week, as the beans turned from white to orange to reddish brown and from purple to brown on the insides), consistency thickened so as to require more effort to turn each day (as liquid pulp drained), the pile heated up and the smell went from acetone to fruit-floral to toasted bread-tomato (like pizza, actually) to strong ammonia. Kim’s fermentation bins are split front to back, so I got a good workout lifting the cacao over the center divider. 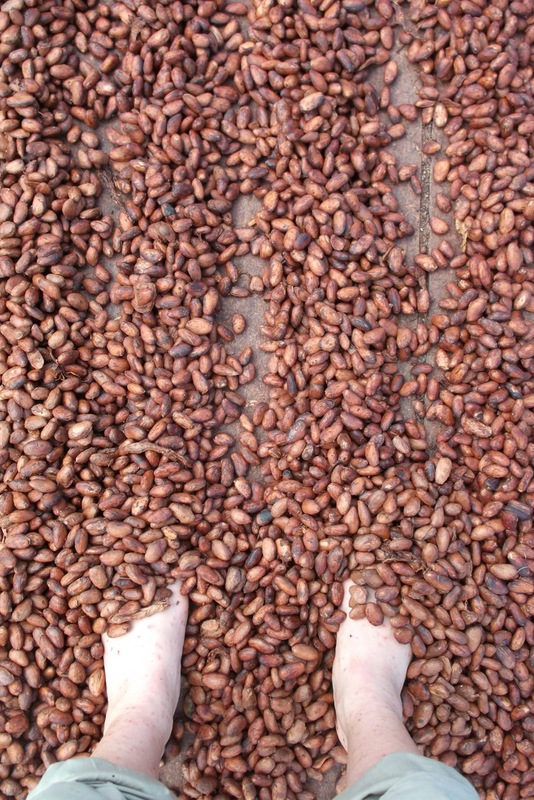 It was heaven for cacaophiles, as I was knee-deep in cacao (in knee boots) during the process. When the beans were fully fermented (about five or six days in this case), I helped turn them in their drying bins to ensure even drying (see photos). In Grenada, workers traditionally shuffle through the cacao every 20 minutes, so thus did I. This was the first country where I’d seen this method, rather than the use of rakes. 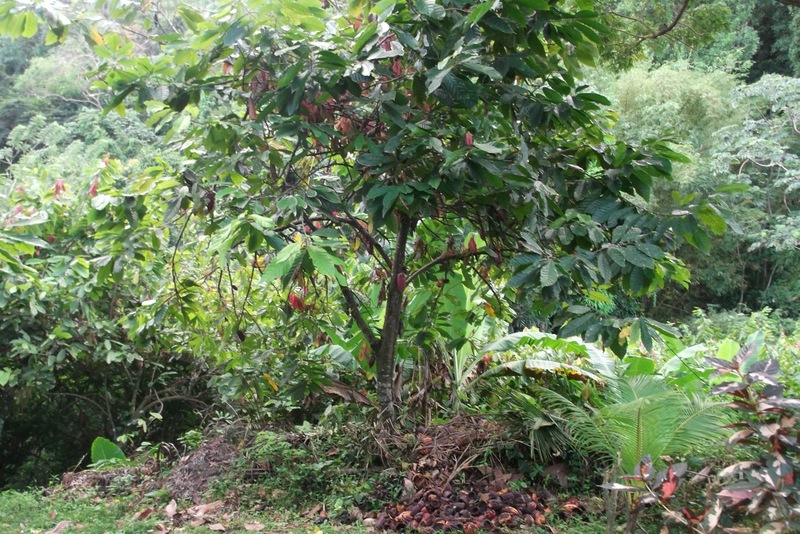 I also helped clear weeds in the cacao orchard on two occasions, which is quite a labor intensive process (photos). This largely involved grazing a machete across the ground to clear fast-growing vines and grasses, done with extra care around cacao tree trunks, along with some targeted cutting at more resilient plants. The two primary farm workers, Gerald and Yvonne, had great skill and strength at this task, and I appreciated their humoring me to let me try my hand at it. The week involved lots of time to enjoy and explore the island—including a visit to GCC and a new, larger-scale chocolate factory, which you can read about in the next post. 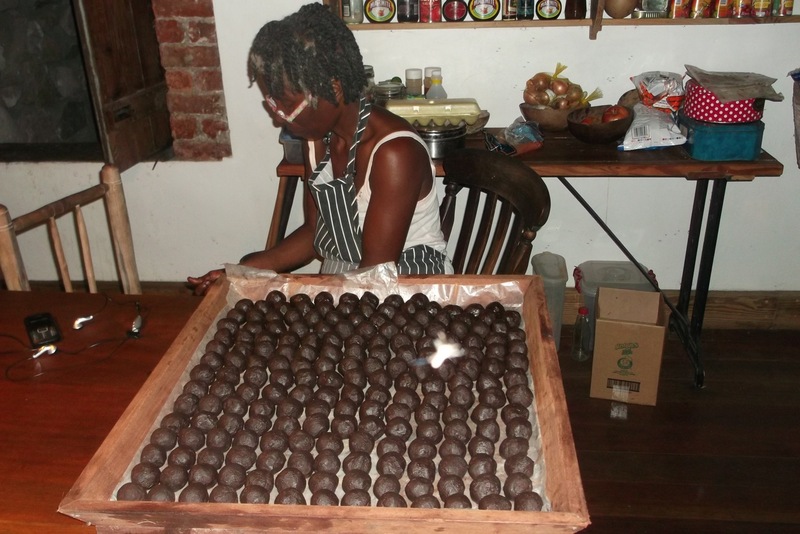 This entry was posted in Agriculture & Food, Chocolate & Cacao, Sourcing & Supply Chain and tagged chocolate-cacao, Grenada, travel, Volunteering Overseas. Bookmark the permalink.